First things first. I want to talk about the most important part of this post that will benefit all of my Austin family, friends and followers! I am so excited to partner with Domain NORTHSIDE and Marine Layer to give y’all an exclusive discount + a $1,000 giveaway! Let me give you the giveaway details before it ends Friday! All you have to do is head to my Instagram post and follow the entry instructions. It is extremely easy and you could win a $1,000 Marine Layer gift card! Marine Layer recently opened up a store here in Austin a little over a year ago and right now they are having an exclusive discount code for all Austinites (DOMAINNORTHSIDE) which will get you 20% off your entire purchase. Just head to Marine Layer in the Domain NORTHSIDE, pick out some goodies and verbally tell them the discount code when you are ready to check out. If they don’t have your size in store, fear not, they can order whatever size you need. 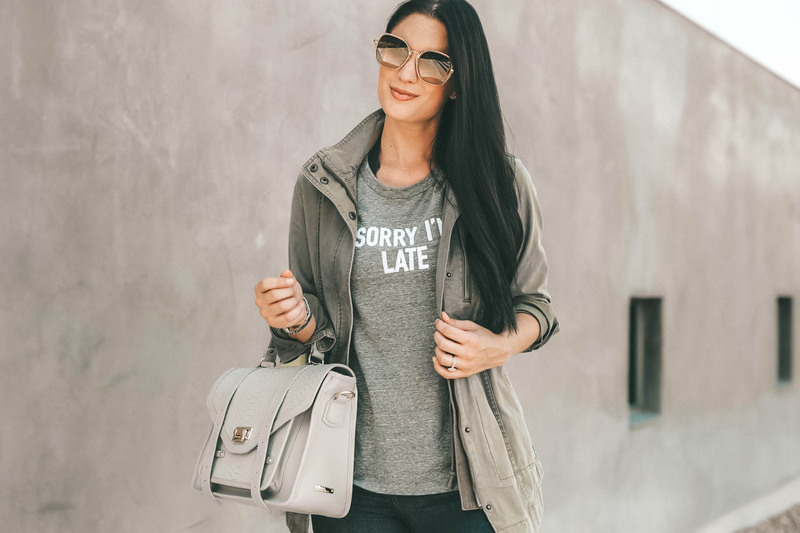 This is the first time I shopped with Marine Layerand have to say, I was pleasantly surprised with how much I loved their clothes. Probably because everything was so soft and cozy! Their signature fabric is made with MicroModal which is made from recycled beechwood. The pulp production is self-sufficient so their tees are sustainable, eco-friendly, and so soft. I should have known from just reading about their slogan – When we say our stuff is soft, we really mean it. It’s not like “oh, this feels nice” soft. It’s “holy sh#% how did they make this I’m never taking it off” soft. I had perused the Marine Layer website prior to shopping in store. I always like having an idea of what I want before going anywhere. It just makes it easier to walk in, grab what you want, try on and go. Not only is the fit amazing but this dress is the perfect transitional piece to take you into Fall. This is dress from their Fall line but I will definitely be wearing it out about in the Summer. Another thing I loved about this dress is the fact that it is lined! It’s literally a double layer dress. Yes, it is a little warmer in the summer but it is going to be perfect to get you through the cooler months. Since it’s double lined you won’t have to worry about those imperfections coming through. It also won’t be as clingy as most cotton dresses. I am wearing a size medium for reference. I don’t like my dresses skin tight so I always go up a size. Grab your moto jackets when the cooler temps roll around! There are so many ways to wear this dress for Fall. Obviously, I will be wearing one of my many suede or leather jackets but you can definitely dress this up with a chic coat and a pair of heels. I paired this dress with two different sets of shoes in this post to show the versatility. Remember, everyone needs the perfect LBD (little black dress) in their closet. Don’t pass this one up! The price point is perfection too. To shop any of these items just click on then descriptions below or any of the images. I also shot another casual look if you are more of a jeans and tee shirt kinda gal. If you don’t own a utility jacket for Fall you are definitely missing out. This is such a practical piece to have in your closet for any occasion. Definitely size down if you want a more fitted look. I opted for a size XS so the jacket didn’t look overbearing compared to the rest of my look. I was actually planning on pairing this jacket with the black dress as well! Their tees are what makes Marine Layer what they are. Marine Layer started with tees and has evolved into so much more. Just know that you are getting the best of the best when you buy one of their shirts. I always love a good graphic tee so this one definitely stood out! Even though I am never late anywhere I go, I still had to have it! Y’all have to swing by and see what Marine Layer at the Domain Northside has in-store and don’t forget to use the discount DOMAINNORTHSIDE for 20% off. 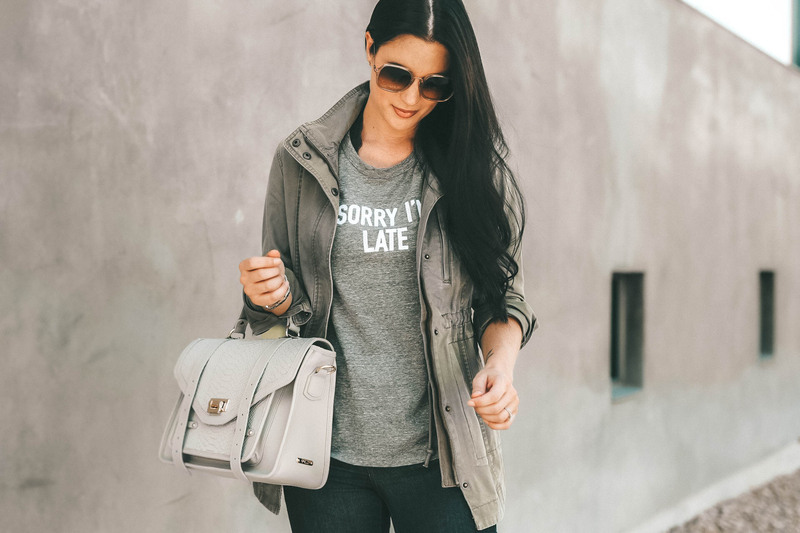 They really do have the perfect comfy and casual goodies for Fall that will give you effortless looks everyday. i love these looks – perfect for any season. you look gorg! Those SHOES in the first outfit!!! LOVE them so much! I LOVEEEE what this brand stands for! Amazing, and the pieces look so comfy. Gorgeous photos! You are always so gorgeous! Love how you rock black and leopard. Such a rockstar! That dress is so chic! I’ve been on the lookout for a good bodycon dress! The dress looks so cute and comfy, and like a perf layering piece for Fall! Absolutely love that graphic tee and need it in my life! Love both of these looks on you gal! Love this whole look! I love that dress with the leopard flats! I am loving these outfits babe! & Those leopard shoes are the perfect pop! Loving all these looks!! That dress looks so good on you! Little black dresses are always a good purchase- no matter how many you have! I need to try this brand though it sounds amazing! Also need that tee because that’s my life! Such a gorgeous look! I love how you can switch it up!! Very versatile! Girl you do all black better than anyone I know! This dress looks so cozy and it fits you perfectly!